We left Cane Garden Bay at about 9:30 the weather had been rainy and squally but it looked ok. We went out and hoisted sails and had all three sails up for a while. We noticed it was darkening to the North and it came in quick and got us. The rain came and the wind…we saw 30 knots and a huge amount of rain. So after a shaky start and a shaky shakedown trip she is working and performing very well for the old lady she is. Stout and true. We furled up the genoa and running on a reefed main and the staysail we managed to sail along and stay relatively comfortable. We have had a lot of weather for this place. It begins to change when I leave and the wind comes up on Saturday and blows 25 to 30 for the week. This afternoon we pick up some fuel and water at Marina Cay and then go into Trellis for the next two nights. Looking forward to going to the Loose Mongoose this afternoon for some libations. Perhaps some shopping for a gift for the Momma at Aragorn’s. 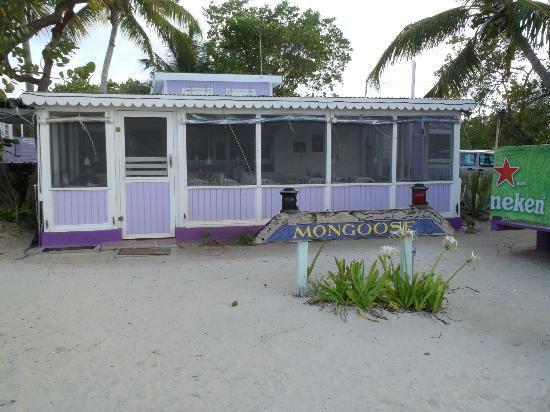 I heard the Loose Mongoose is closed permanently! Please let us know!!!! It is sort of open.. Happy hour, and dinner, some weekends for lunch. Looks tired, under stocked and abused…we passed on it.